When I think of food heaven, I think of doughnuts oozing with jam and cream, decadent slices filled with a thick layer of caramel, dense and fudgy chocolate brownies, freshly baked cookies, cakes piped with meringue, white chocolate truffles, fresh salads, Ciabatta sandwiches with salmon and avocado, breakfast baps, and last but not least, beautifully presented plates of brunch fare, my favourites being French toast, pancakes and eggs done various ways. And now, thanks to owners Fran Mazza (an amazing pastry chef) and Aaron Carson (former owners of Hello Friends + Allies), a beautiful new cafe has opened up in Parnell, namely Winona Forever, which will transport you to ultimate foodie heaven and I guarantee you will never want to leave. We visited on the weekend, and the cafe was bustling with people. We headed to the main counter to be seated and at this point, I had gone into foodie shock. My eyes lit up, my mouth dropped open and out came the camera, because each slice, doughnut, cake, roll, brioche, scone, cookie and meringue out of their glorious food cabinet will be a feast for your eyes, nose and mouth. I have so far tried a slice of their Coconut Caramel (pictured below) and a Cheesy delicious scone (both melt in your mouth). Winona Forever definitely has one of the best looking food cabinets in Auckland. While coffee is usually the morning choice of beverage, we loved the sound of their hot chocolates which came with hot milk to pour over your chocolate on a stick, while watching it melt. We recommend their Dark Chocolate & Orange and White Chocolate & Coconut flavours. On the side were Turkish Delight marshmallows – yummy! If hot chocolates are not your thing, then Winona Forever also serves Supreme Coffee, sodas, smoothies (try their peanut butter and jam), Fine & Dandy teas and fancy lattes, like turmeric and beetroot. They are also licensed, serving a small selection of wine and beer. We then ordered from their all day menu, which consists of 17 dishes, with the likes of eggs your way, coconut chia seed pudding, mini ricotta doughnuts, a green breakfast bowl, mushroom crepes, the usual big breakfast and most surprising, prawn tortellini. While all of the dishes sounded like perfect brunch fare, I was set on ordering The Eton Rifle, their twist on the classic French toast. Picture brioche French toast with Eton mess, piped meringues, whipped mascarpone cream, summer berries and raspberry gin compote. Sounds amazing! The dish was beautifully presented, not overly sweet (which meant I could have the hot chocolate too) and I loved the crunchy texture of the meringue and the addition of freeze dried berries. We also tried their Anzac Granola, with maple, pecan and pistachios, complete with coconut yoghurt and seasonal berries. The granola was very sweet, but combined with the yoghurt and fresh fruit, the flavours balanced out well. Food aside, we loved the quirky decor, with the spray painted pillars (look out for the lightning bolt) and the painted mural on the benchtop counter bar overlooking Parnell Road, the hanging plants and space-like lights. The cafe also has ample seating, both inside and out, and despite the incredibly busy day, the staff were welcoming and friendly, plus we didn’t have to wait long for our food – always a bonus! 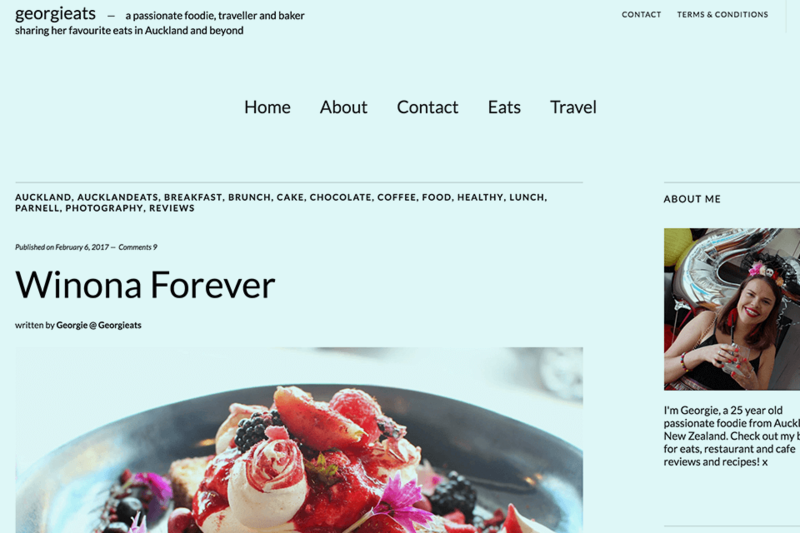 So, if you find yourself drooling over the likes of their Eton Mess French toast, something sweet or savoury from their food cabinet, or fancy an extra-indulgent hot chocolate, then Winona Forever should be next on your foodie list. And an important note to Johnny Depp: you really should have kept your tattoo, because you would be extremely proud of this Winona and her brilliant food!